Nourish and hydrate blonde, highlighted or grey locks with the Expert Colour Care Platinum Conditioner from Jo Hansford. 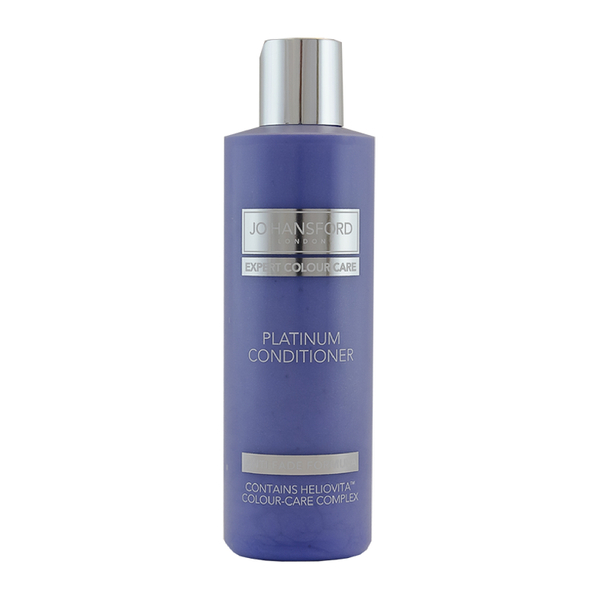 Specially formulated with violet colours, the mild conditioner neutralises yellow or brassy tones and removes discolouration to leave hair refreshed and radiant. The brand's unique Heliovita™ Colour Care Complex makes the shampoo gentle enough for daily use, whilst its Anti-Fade Formula maintains hair colour and leaves locks calm and manageable. Developed with sunflower seed extract to shield hair from UV radiation and a Prodew Amino Acid Blend to strengthen and repair locks. Sweet Blue Lupin Peptides penetrate strands by binding to the hair shaft and are scientifically proven to keep hair vibrant for up to thirty washes. The lightweight conditioner is enriched with nourishing pomegranate oil so you can experience healthy-looking, silky smooth locks. E.N. After shampooing, gently massage conditioner into the hair. Comb through and then rinse thoroughly. Aqua (Water), Cetearyl Alcohol, Cetyl Alcohol, Cetrimonium Chloride, Behentrimonium Chloride, Phenoxyethanol, Benzyl Alcohol, Punica Granatum (Pomegranate) Seed Oil, Hydroxypropyl Guar Hydroxypropyltrimonium Chloride, Isopropyl Alcohol, Hydroxyethylcellulose, Limonene, Sodium PCA, Butylene Glycol, Sodium Lactate, Parfum (Fragrance), Disodium EDTA, Citric Acid, Arginine, Dehydroacetic Acid, Aspartic Acid, Hydrolyzed Lupine Seed Extract, Helianthus Annuus (Sunflower) Seed Extract, PCA, Glycine, Alanine, Serine, Valine, Glucanolactone, Threonine, Proline, Isoleucine, Phenylalanine, Histidine, Sodium Benzoate, CI 60730 (Acid Violet 43).